Osteoporosis is a condition that affects the bones. Bones become brittle and more likely to fracture. 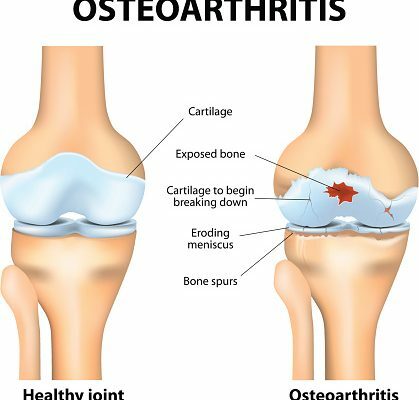 Osteoarthritis, on the other hand, is a painful form of arthritis that affects the joints in the body. Both conditions can be debilitating, but where a person with osteoporosis must be careful to avoid injury, those living with osteoarthritis cannot avoid the wear and tear between their joints. Walking and regular movement become an issue for those with osteoarthritis. This is because the cartilage between joints wears away. Cartilage can be compared to a pillow that cushions your head. Without a pillow your head lies flat on a mattress, which can be uncomfortable and causes kinks in your neck and pain. Without cartilage between joints, it too, can lead to discomfort, pain and even damage to the joints. In fact, this rubbing of the joints together can lead to what’s called “osteophytes” – bony outgrowths at the end of the bone that cause damage to tissue and ligaments. Below is a chart to help you compare the differences between osteoporosis and osteoarthritis. What came first the osteoarthritis or inflammation? Well for many years the answer to that question has boggled the minds of researchers, and so the question is continuously studied. What has always been clear is inflammation is present in osteoarthritis, but how or why, or even when it is triggered has always been a mystery. The Cleveland Clinic reports of studies that show inflammation is ongoing and results in permanent damage to the joints. Other studies have shown that individuals with prior inflammation – either caused by trauma or family history – had a higher risk of developing osteoarthritis. One thing for certain is that inflammation is a factor in the development of osteoarthritis. Diet can play a large role in the treatment of osteoarthritis. Food can be a form of medicine and assist us through many ailments. It’s important to eat the right foods. First and foremost, because being overweight can be a risk factor for developing osteoarthritis, it’s important to eat foods that promote a healthy weight and don’t contribute to added pounds. Avoid food options high in sugar, fat, fried or even processed. Not only will they extend your waistline, you won’t feel your best. Fiber is also essential for an osteoarthritis diet. Many medications to combat pain associated with osteoarthritis can cause constipation, so adding fiber to your diet can ensure everything passes along nicely. Enjoying foods high in fiber, along with staying hydrated, can help you stay regular and avoid side effects of pain medications. Remember to enjoy balanced meals that contain your essential vitamins and nutrients. Vitamins and nutrients help the body heal and stay its best. Many nutrients can also help combat inflammation, which is linked to osteoarthritis. By sticking to these basic rules for a diet to help guard against osteoarthritis you can help yourself feel better, stronger and reduce pain naturally.